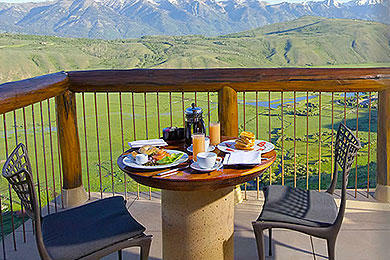 I’m a big fan of the Aman chain of luxury resorts, and Amangani is renowned for its Jackson Hole location. So on a recent trip to Jackson Hole, Wy., I knew I needed to check it out. I know that sometimes “luxury” doesn’t mean children are welcome, but I’ve seen a number of hotels that are both luxurious and kid-friendly, including Aman Resorts’ gorgeous Amanyara in Turks & Caicos. I was disappointed to find Amangani is not necessarily a case of luxurious accommodations with a children-friendly atmosphere. Of Amangani’s 40 suites, none can accommodate more than four guests. The suites feature one king bed, a day bed that doesn’t look to be the most comfortable for sleep, and room for a rollaway bed or crib. 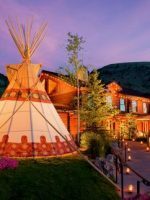 The resort does arrange for tours and activities for kids in the summer, but in the cooler months, there isn’t much onsite entertainment to keep a child busy, besides the resort’s gorgeous heated outdoor pool, which overlooks Snake River Valley. The best bet for families wanting to enjoy the Aman experience and setting would be to rent one of the six available rental homes in their collection of 26 onsite properties. The largest rental home features six bedrooms, can sleep 12 people comfortably and has its own pool. The homes also feature living, dining and kitchen space, so families can elect to cook, which they cannot do in the resort’s rooms. Both home and hotel guests can dine in the resort’s onsite Grill, the resort’s only restaurant, which provides room service and serves breakfast, lunch and dinner daily. Although not for everyone with children, it does go without saying that guests of the hotel and the homes receive Aman Resorts’ above and beyond service and treatment — one luxury that any family can appreciate at any time of year. The resort features 40 suites on two stories of property, all with fireplaces and floor-to-ceiling windows overlooking Snake River Valley and the Grand Tetons. The most popular suites are the three Grand Teton Suites, which have the best corner views. The rooms feature a king bed and a daybed, and can also accommodate a rollaway bed. The Superior Suite is the most available suite (29), but also the smallest, featuring a king bed and room for a rollaway or possibly offering a daybed. The Sena Suite provides a little more breathing room, with 1.5 baths, while the Spring Gulch Suite is the largest of the suites and includes a terrace. Rooms are decorated with the elements of the mountains: terrazzo tables, woven cowhide chairs in faux wolf fabric, pine stump tables, slate fireplaces and showers and platform beds and floors in woods like redwood, pine and cedar. Bathrooms are large and feature deep-soaking tubs, a separate shower, twin vanities and a large dressing area. Rooms are equipped with a CD player, DVD player and flat-screen TV, and provide Wi-Fi access. Six homes are available for rent through Amangani and provide all the services of the hotel, including housekeeping, room service and amenities. Rooms are decorated similarly to the resort with natural elements, and offer up to six bedrooms with living rooms, dining rooms, fully equipped kitchens and terraces. Beautiful, amazing views, relaxing, nice staff, not the normal Aman experience but still very nice! 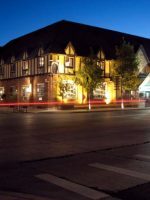 We were so looking forward to spending two nights at Amangani after snowboarding and skiing at Jackson Hole for 3 days!! We love Aman properties and have stayed at several in the past. Our stay started a little off as we drove up to the property and nobody came out to greet us. It wasn't a big deal so I jumped out of the car and started organizing our things. After 5-10 minutes, we still were by ourselves getting our things together. Finally, someone, as we were walking in, came out to greet us. We entered into a beautiful Aman space and had the usual tour of the property. The property itself is gorgeous and smells wonderful! The woodwork is gorgeous but definitely needs a bit of love. There are small dings and scratches on most of the wood. I would not normally notice or say anything about such a small thing but we were at an Aman! Aman properties are known as being some of the finest in the world and unfortunately are probably highly critiqued by their clients. Our room was amazing and absolutely gorgeous!! We had wonderful views, a fireplace, large bathroom, comfortable bed, floor to ceiling windows and a large deck. It would have been nice if our deck was shoveled from the snow so we could sit outside during the day. Adding a space heater would have been a nice touch as well. We had a wonderful time relaxing around the property! Every day we worked out in the gym which was very small for such a high-end property! We were also a bit taken back by the different employees who worked at the spa desk. We would walk by, fill our water bottles with fruit water right in front of their face and they never smiled, said hi or asked if we needed anything. All of this would normally be fine but not for an Aman. We loved sitting in the hot tub while the sun was setting! A couple of nice touches would have been to shovel the snow so the guests could see the gorgeous view from the hot tub. Another nice thing would be for the staff to pick up the guest's dirty dishes after they finished eating. At one point there were dirty dishes and empty glasses everywhere around the hot tub. The wonderful and very kind staff doesn't seem to be trained for high-end service. This is not their fault as they were definitely trying. The staff would come to take drink orders but walk away empty handed. The same thing happened at breakfast. We would sit down and look at an empty table but dirty dishes everywhere. Once again, not a big deal for an average property but we were truly expecting an Aman experience! On a positive note, the staff we interacted with was very, very nice! Your chef came out and showed us our piece of meat before cooking it and was professional and amazing! The sophisticated woman from Japan was wonderful! Our room was beautiful and the views from the property were gorgeous! 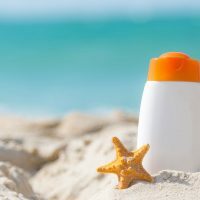 I love Aman properties and I was definitely a bit saddened by our experience! I almost want to come in and hang out with your staff and train them for free as I really want your property to be Aman quality! This place was off the charts. Quiet and peaceful yet fully staffed. We felt the staff went out of their way to make us comfortable. The ski transport and staff at the mountain were great, made this trip easy. One evening we were tired of the "very good" yet formal meals and asked if we could order off the menu. The chef came out, spoke to us and made a pizza from scratch. Wood burning fire, pizza and a cold beer in a 5 star. HOME RUN, we will be back. 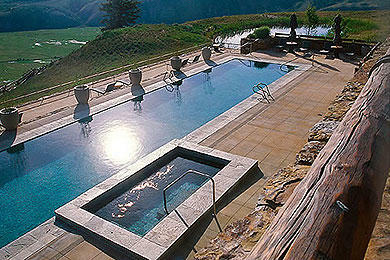 There isn't much to entertain the kids on property, other than the resort's outdoor heated 115-foot swimming pool. In the winter, the resort even heats the patio surrounding the pool, so wet feet never have to step out onto a cold surface. 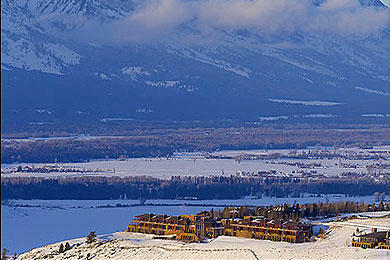 In the winter, the resort provides complimentary shuttle service to Jackson Hole Mountain resort. Arrangements for rentals and lessons can be made at the resort's lounge, which also provides snacks and hot beverages. Private guides can be arranged to take families into the neighboring environment, including tours around the river, lakes and mountains to spot elk, moose and other animals. Dinner sleigh rides take place along the ridge of the butte and are followed by dinner at The Grill. Guests of the resort can also enjoy a private tour of the National Wildlife Art Museum, followed by a 45-minute sleigh ride. 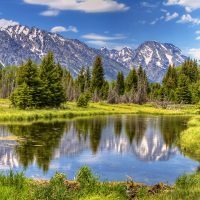 During the summer months, the concierge team runs an Explorers program to provide activities and events for children, most of which involve the wonderful Grand Teton scenery and wildlife. 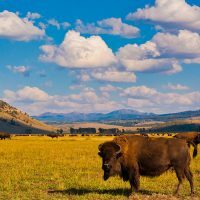 In the fall, horseback riding, fishing on Snake River, mountain biking, hiking and other tours can be arranged. The resort's 65-seat restaurant, The Grill, is open for breakfast, lunch and dinner, in a setting that also blends into the resort's mountainside environment. Slate floors, redwood-paneled walls, and rawhide and rattan chairs compliment the space, where local, sustainable foods, including local game, are served. The Grill, which can also prepare picnic lunches for afternoon outings, provides room service. A complimentary shuttle brings guests to Jackson Hole Mountain Ski Resort. Summer is the resort's busiest season, with winter ski season following closely behind. 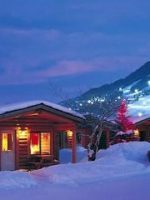 The end of January through February is slower, and the resort is often quiet during these months, as well as fall and May through mid-June. Amangani is located 10 minutes from the town of Jackson and 10 minutes from the local airport. 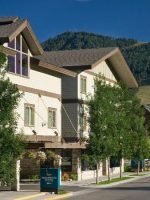 Located in the boundary of the Grand Teton National Park, the resort is also a short drive to Yellowstone National Park and minutes away from Jackson Hole Ski Resort. Amangani's Spa and Fitness Centre features a quiet, reclusive spa for treatments in one of four rooms, including one couples room. Treatment rooms feature iPod docks so guests can play their own music. The Centre also provides adults with a full gym, yoga room, steam rooms and a locker room. A hot tub is located next to the outdoor pool.